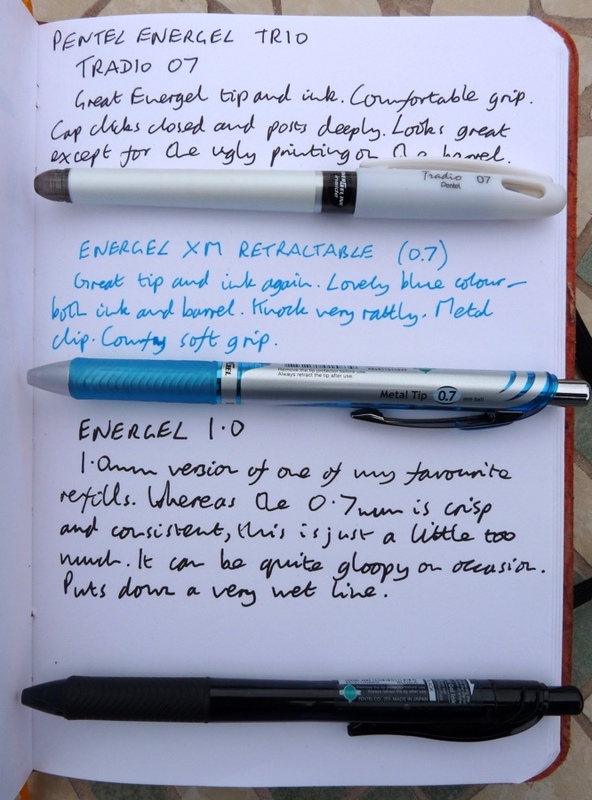 A Review of Three Pentel EnerGel Gel Ink Pens – Pens! Paper! Pencils! 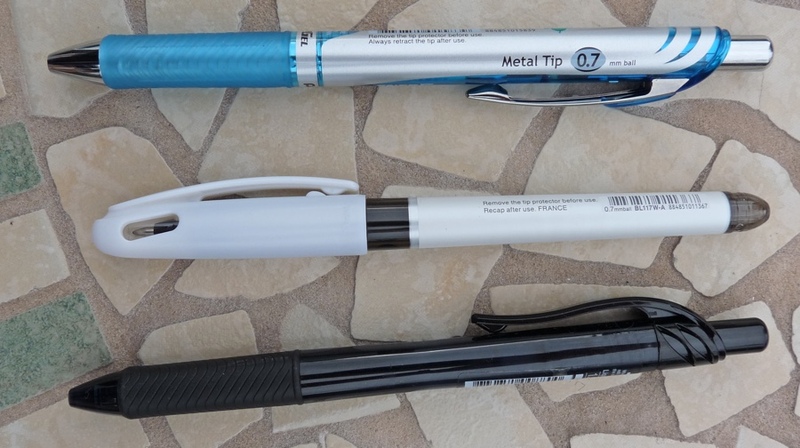 Pentel were kind enough to send me three of their EnerGel based pens to review. These are all budget pens and are available in many high street shops. 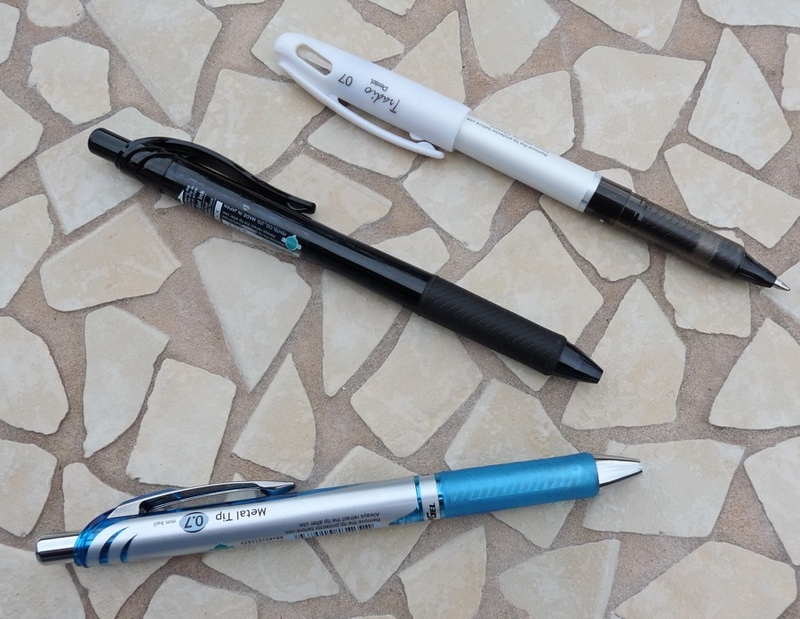 The EnerGel 07 is one of my favourite refills (I use daily it in my Ti2 TechLiner) so I was interested in seeing how different models compared. The Tradio 07, as far as I can tell, uses exactly the same refill as the EnerGel 07. This is a good thing. It puts down a crisp and consistent line that’s good and dark and dries reasonably quickly. The difference is in the barrel, which is a soft white, with a dark translucent grip section. More significantly, unlike the retractable EnerGel it has a cap. The barrel looks great but is totally ruined by pointless printing on the side. The cap closes with a click and posts deeply. It’s not too short to use unposted nor too long to use posted. There’s a neat little window in the cap so you can see the tip. Completely without function but I like how it looks. The clip is a flimsy fairly useless thing. The EnerGel XM Retractable is identical in size and shape to the standard model. However it has metal hardware: knock, tip and clip. The clip is good – firm and strong. It also has a quite stylish blue grip and part of the body is a translucent blue. Why all this blue? Because for each purchase some money goes towards research into prostrate cancer. There is a pink version for research into breast cancer. This is great even though I don’t like this whole blue = boy, pink = girl thing. I’m fighting a losing battle on that one, I know. The ink is a lovely vibrant blue. Too many blue pens have boring blue ink but this one really sparkles. The only thing I don’t like about this pen is how much it rattles when in use. Rattly knocks – a pet peeve. Finally, we have a standard EnerGel but with a 1mm tip rather than a 0.7mm one. I don’t like this very much and I don’t think it’s because I’m not such a fan of broad gel ink pens. It just feels as if the ink is flowing a little faster than the pen can manage. It can be a little gloopy on first write, too. It’s good to be able to try a few varieties of this pen out. I’d avoid the 1.0 EnerGel. The Tradio is worth considering if you really love the looks of it, don’t mind the terrible printing and would like a pen with a cap. It’s a lot more pocket safe than a retractable pen. 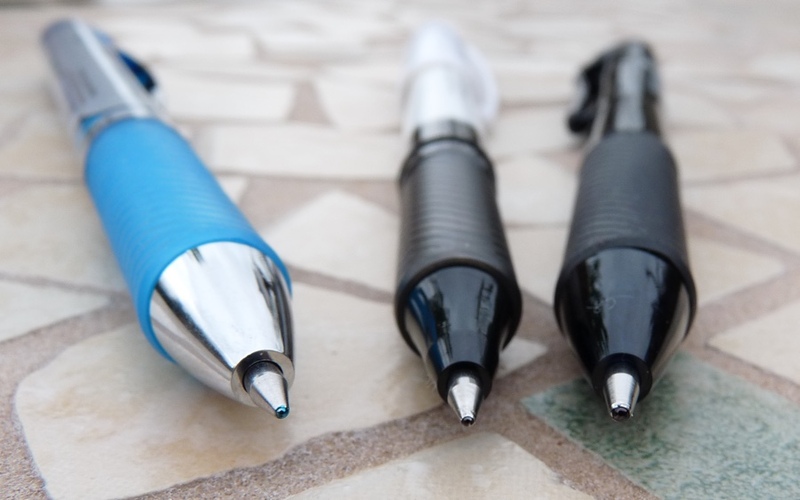 The XM is a lovely pen with lovely ink, available with pink or black ink if you don’t like the blue. The XM is the one I would buy if I was going to use the refill in its original body. As it is, I’m only usually after the refill and so go for the cheaper standard EnerGel 07. Thank you to Pentel for sending me these pens to review and to keep. I haven’t let that influence my views. 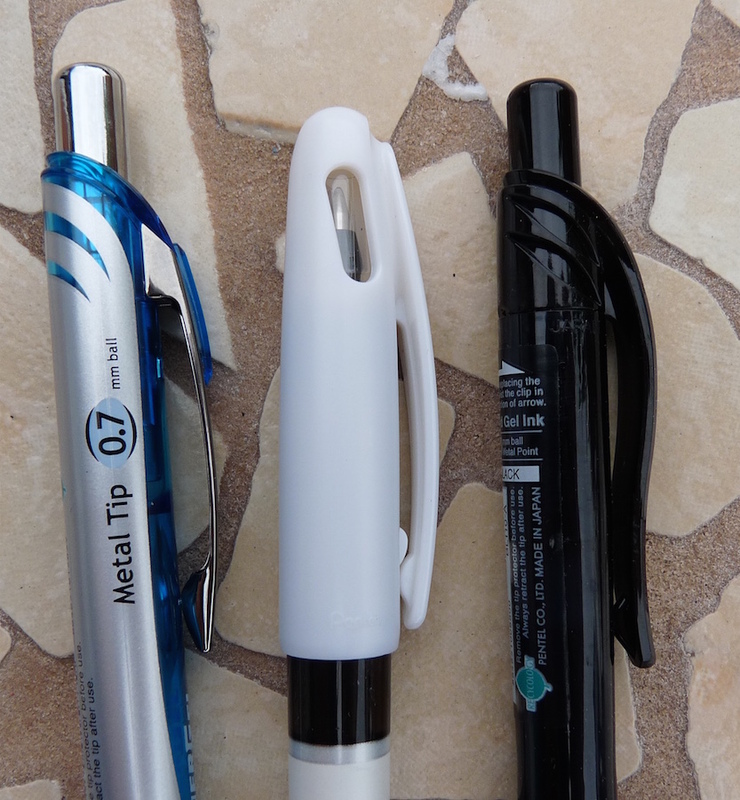 I love any pentel or pilot rollerballs. These are fantastic. 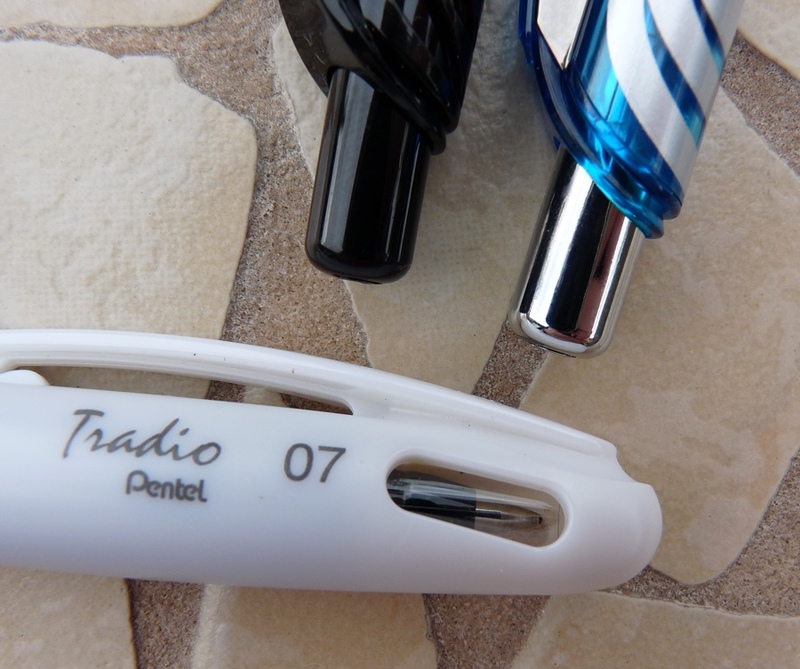 I may be remembering incorrectly, but I think Pentel have other types of pen in that Tradio range – I wonder if the window is so you can see whether you’ve picked up a rollerball, or a fountain pen before you uncap..? MISERABLE GD Pentel EnerGel Retractable POS pens! Every one of them has catastrophically separated into their component parts except one–after maybe 50 retractions–and have had to be DUCT_TAPED back together, because they won’t stay together without it. Which kind of defeats the purpose of the “comfort grip”. If I wasn’t slightly addicted to the 0.7mm needle tip and the ease of writing, I’d be using them for target practice! !